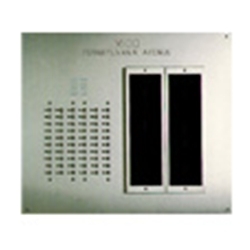 Authentic Parts 3000 Series custom lobby panels are designed for indoor or outdoor use and are compatible with all intercom systems. Each panel is made from premium grade 16-gauge satin-finish, stainless steel and includes a 45 ohm Mylar speaker, all metal pushbuttons, black filled engraved apartment numbers, engraved address and/or building name. A company name and phone number can also be engraved at no additional charge*. 3000 Series custom panels may be made to your desired height and width. Please specify the size when ordering. You may also select flush or surface mounted units. Every panel comes complete with backbox and top mount directory (unless specified otherwise).